Odontogenic tumors of epithelial origin commonly seen in the posterior mandible are often treated with surgical excision. Cantor and Curtis provided a hemimandibulectomy classification for edentulous patient that can also be applied in partially edentulous arches. Apart from the deviation of mandible to resected side, other dysfunctions observed are difficulty in mastication, swallowing, speech, mandibular movements, and even respiration. 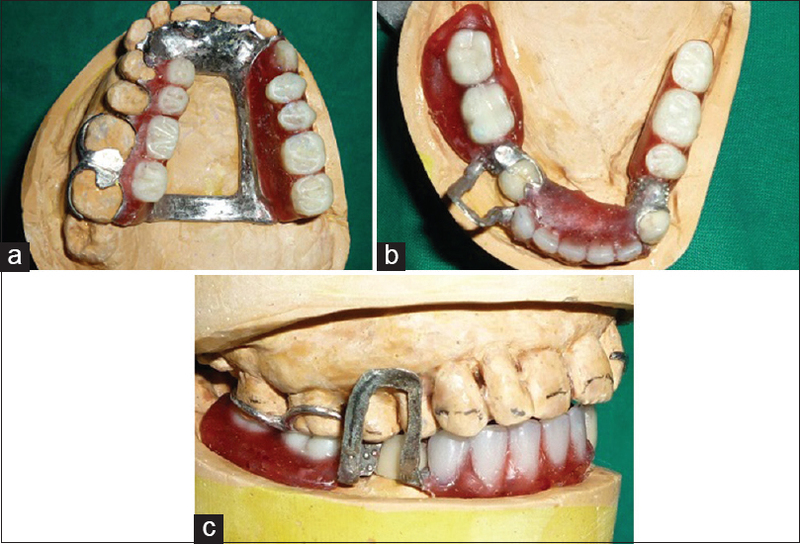 This case report describes prosthodontic management of a patient who has undergone a hemimandibulectomy and was rehabilitated using a provisional guide flange prosthesis followed by a definitive maxillary and mandibular cast partial denture designed to fulfill the patient's needs and requirements. A 44-year-old female patient reported to the Department of Prosthodontics with the chief complaint of difficulty in chewing food due to the deviation of jaw, missing teeth, and wanted replacement of teeth [Figure 1]a. The patient gave a history of supari chewing since 20 years, 8-10 times/day. The patient was diagnosed with early squamous cell carcinoma involving left buccal mucosa and mandibular alveolus and thus left side hemimandibulectomy was performed 6 months ago. Radiation therapy was completed a month before. Extraoral examination revealed facial asymmetry, deviated lower third of face, decreased mouth opening, significant deviation of mandible to left side on mouth opening, left corner of mouth drooping downward, angular cheilitis, and left condyle and ramus absent on palpation. The patient could manually guide herself into occlusion. Intraoral examination revealed left mandibular defect distal to lateral incisor, surgical skin graft seen on resected side, 23-27; 34-37, 32-43, and 45-47 teeth missing. Maxillary and mandibular arches were partially edentulous, representing Kennedy's Class II and Class I condition respectively. Both the ridges were smooth, round with well-keratinized mucosa with sufficient height and width for support. Root pieces were present in the 46, 47 region. Orthopantomogram revealed the absence of the mandible distal the mandibular left canine [Figure 1]b. The case was diagnosed as Cantor and Curtis Class II mandibular defect. Treatment plan decided was mandibular guide flange prosthesis to aid in correction of mandibular deviation, followed by a definitive prosthesis of a maxillary cast partial denture with double row of teeth on nonresected side and a mandibular cast partial denture retained by precision attachments with a buccal guiding flange. Preliminary impressions were made in addition silicone-putty (Ad-Sil Putty, Prime Dental Pvt. Ltd., Mumbai, Maharashtra, India) in an adhesive coated custom tray. Due to limited mouth opening, a satisfactory impression could not be made in a stock tray. Custom trays were fabricated in autopolymerizing acrylic resin (DPI Auto polymerized acrylic resin, Mumbai, Maharashtra, India) on primary casts of another patient having a closely resembling arch form [Figure 2]a. The maxillary impression was made in two parts, held together by orientation blocks made on polished surface of custom tray [Figure 2]a and b. Casts were poured in Type III dental stone (Dutt Stone, Dutt Industries, Mumbai, Maharashtra, India). Denture base was fabricated in autopolymerizing acrylic resin (DPI Auto polymerized acrylic resin, Mumbai, Maharashtra, India), and occlusal rims were fabricated in modeling wax (Maarc, Shiva Product, Mumbai, Maharashtra, India) and jaw relation was recorded. The patient's tactile sense or sense of comfort was used to assess the vertical dimension of occlusion. The patient was advised to move the mandible as far as possible to the untreated side manually and then gently close the jaw into position to record a functional maxillomandibular relationship. Maxillary cast was mounted using facebow record (Hanau Spring bow; Whipmix Corporation, Louisville, KY, USA) on a semi-adjustable articulator (Hanau Wide-Vue; Whipmix Corporation, Louisville, KY, USA) and mandibular with reference to the recorded jaw relation. The prosthesis was designed with a buccal guiding flange and a supporting flange on the lingual side [Figure 3]a. Retention was provided by retentive clasps made from 19 gauge round, stainless steel orthodontic wire (KC Smith and CO, Monmouth, UK). The guide flange extended superiorly on the buccal surface of the maxillary premolars allowing the determined occlusal closure. The guide flange was sufficiently blocked to avoid trauma to the maxillary teeth and gingival during functional movements. Acrylization was done using heat cure acrylic resin (DPI Heat polymerized acrylic resin, Mumbai, Maharashtra, India). Clear acrylic (DPI Heat polymerized clear acrylic resin, Mumbai, Maharashtra, India) was used for flange for esthetic purpose. The prosthesis was finished and polished and inserted intraorally [Figure 3]b. The patient wore the guiding flange for 4 months followed by extraction of root pieces in the region 46, 47. The definitive prosthesis was then fabricated consisting of maxillary and mandibular cast partial denture. Crown preparation was done for 33, 44, and final impression was made in addition silicone (Ad-Sil light body, Prime Dental Pvt. Ltd., Mumbai, Maharashtra, India). The cast was poured in die stone Type IV and wax pattern was made. Extracoronal attachment OT strategy (Rhein 83, USA) was attached to the pattern such that it directed toward the center of the ridge. Casting followed by metal trial, ceramic build up and bisque trial was done. The final crowns with attachment were seated, pick up impression was made for mandibular arch and final impression for maxillary arch in addition silicone, double mix double step technique (Ad-Sil Putty and light body, Prime Dental Pvt. Ltd., Mumbai, Maharashtra, India). Casts were poured in die stone, Type IV gypsum (Ultrarock, Kalabhai Dental, Mumbai, Maharashtra, India) [Figure 4]a and blocked out. Casts were duplicated in refractory material (Wirovest, Bego, Germany) using agar (Wirogel M, Bego, Germany). Wax pattern was made and casting was done to obtain cast partial denture framework [Figure 4]b. Framework trial was done, followed by recording the jaw relation. Teeth arrangement (Acryrock, Ruthinium Dental Products Pvt. Ltd., India) was done [Figure 5]a-c and trial denture was evaluated. Acrylization was done in heat cure acrylic resin (Lucitone 199, Dentsply, York Division, USA) [Figure 6]a. Denture was finished, polished, and inserted in patient's mouth [Figure 6]b and c]. Patient wore the denture for 10 days to acclimatize and the guiding flange was cut off. Significant reduction in mandibular deviation was observed and maximum intercuspation could be achieved due to the guidance from the twin row of teeth. The patient was very satisfied with the functional and esthetic performance of the prosthesis. Patient has been on a periodic recall for 4 years. This article describes functional rehabilitation of hemimandibulectomy patient who has undergone resection without reconstruction. Guide flange helps in such cases to prevent deviation of the mandible, improve masticatory function and esthetics. This therapy is most successful in patients for whom the resection involves only bony structures, with minimal sacrifice of tongue, floor of the mouth, and adjacent soft tissues. The exercise as suggested by Beumer et al. was suggested to the patient. In this procedure, following maximum opening, the patient manipulates the mandible by grasping the chin and moving the mandible away from the surgical side. These movements tend to loosen scar contracture, reduce trismus, and improve maxilla-mandibular relationships. The guide flange was used for a period of 4 months until the patient experienced considerable decrease in deviation (improvement was observed after 4 weeks of insertion). The success in rehabilitating a patient with hemimandibulectomy depends upon the nature and extent of surgical defect, treatment plan, type of prosthesis, and patient co-operation. The earlier the mandibular guidance therapy is initiated in the course of treatment, the more successful is the patient's definitive occlusal relationship. Any delays in the initiation of mandibular guidance appliance therapy, due to problems such as extensive tissue loss, radiation therapy, radical neck dissection, flap necrosis, and other postsurgical morbidities may result in an inability to achieve normal maxillomandibular relationship. Root pieces were extracted later during the stage of the definitive prosthesis since the patient had a history of radiation therapy and the extraction was delayed to avoid osteoradionecrosis. Definitive treatment involved fabrication of a maxillary cast partial denture with two rows of teeth. The arrangement helped in better intercuspation and thus improves mastication. The palatal row of teeth provided favorable occlusal relationship, and the buccal row of teeth supported the cheeks. A functional occlusal record was obtained in wax placed lingual to the maxillary posterior teeth and used as an index to arrange the palatal row of teeth. To obtain stable occlusal intercuspation, the mandibular teeth on the unresected side were arranged buccal to the crest of the ridge and teeth on the resected side more lingually. The guide flange was cut off from the mandibular cast partial denture once the patient was acclimatized to the new prosthesis. The twin row of teeth helped maintain intercuspation thereafter. Mastication was confined to the nonresected side only and the teeth on the resected side provided bilateral occlusion and thus stabilization of the prosthesis. Recalls were carried out over a period of 4 years, and the patient reported an increase in masticatory efficiency and seemed happy with the treatment. Attachment retained prosthesis in such cases is valuable because of the stress breaking effect. Esthetics is greatly improved without any metal display. Retention provided by the attachment can be increased with the various retentive caps as per the patients comfort. In this case, extracoronal attachment was used on a single tooth on ether sides, thus special attention was given to maintain favorable crown: Root ratio. Mesial rests coupled with precision attachments were used for effective stress distribution. Both teeth exhibited sufficient root length and bone support. The teeth were evaluated during the periodic recalls and a healthy periodontal status was maintained. 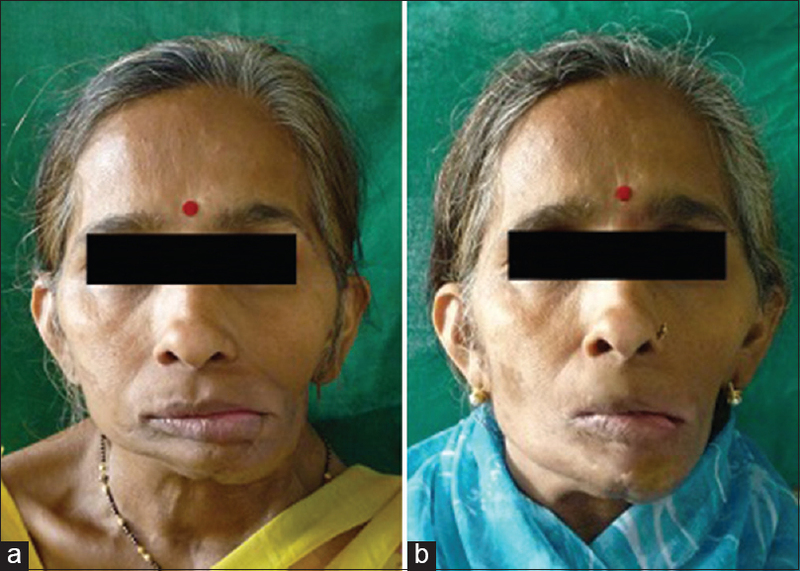 Considerable improvement in facial profile of the patient was observed posttreatment [Figure 7]a and b and further improvement was seen during recall visits. The prognosis of the prosthesis in functional rehabilitation of hemimandibulectomy patient who has undergone resection without reconstruction is guarded. Guide flange prosthesis is most common treatment modality. However, in cases where sufficient numbers of abutment teeth are not present and where deviation is massive, providing twin occlusion rehabilitates the patient functionally. Surgical reconstruction by implants and grafts of various types is the ideal treatment when feasible. However, it is not always feasible in every patient, alternative prosthodontic approach has to be considered to restore the esthetics and function in such subject. Aramany MA, Myers EN. Intermaxillary fixation following mandibular resection. J Prosthet Dent 1977;37:437-44. Buemer J, Curtis T, Firtell D. Maxillofacial Rehabilitation. St. Louis: Mosby; 1979. p. 90-169. Taylor TD. Diagnostic considerations for prosthodontic rehabilitation of the mandibulectomy patient. In: Taylor TD, editor. Clinical Maxillofacial Prosthetics. Chicago: Quintessence Publishing; 2000. p. 155-70. Beumer J 3 rd , Curtis TA, Marunick MT. Maxillofacial Rehabilitation: Prosthodontic and Surgical Consideration. St. Louis: Ishiyaku EuroAmerica; 1996. p. 184-8. 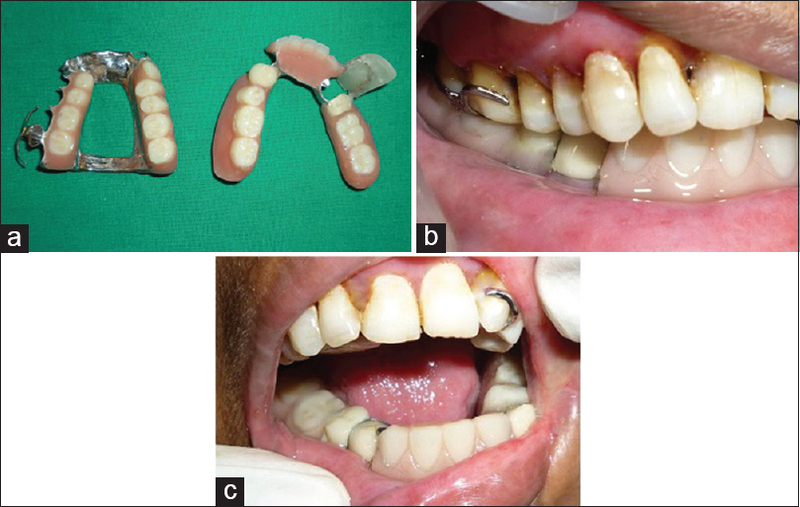 Shetty P, Baliga M, Rodrigues S, Dixit S. Prosthetic management following mandibular resection: Clinical report. J Nepal Dent Assoc 2009;10:57-60. Schneider RL, Taylor TD. Mandibular resection guidance prostheses: A literature review. J Prosthet Dent 1986;55:84-6. Beumer J 3 rd , Marunick MT, Esposito SJ. Maxillofacial Rehabilitation. 3 rd ed. Chicago: Quintessence; 2011. p. 87-9, 118-20. Sahin N, Hekimoğlu C, Aslan Y. The fabrication of cast metal guidance flange prostheses for a patient with segmental mandibulectomy: A clinical report. J Prosthet Dent 2005;93:217-20. Hasanreisoglu U, Uçtasli S, Gurbuz A. Mandibular guidance prostheses following resection procedures: Three case reports. Eur J Prosthodont Restor Dent 1992;1:69-72. Adell R, Svensson B, Bågenholm T. Dental rehabilitation in 101 primarily reconstructed jaws after segmental resections - Possibilities and problems. An 18-year study. J Craniomaxillofac Surg 2008;36:395-402.